The broadside declaration is illustrated with a headpiece of Hercules strangling the Nemean lion as two astonished elders look on. Beneath the woodcut is the line, "Thou shalt tread upon the lion and adder; the young lion and the dragon shalt thou trample under feet." On either side of the image are quotations from Scripture condemning the evils of slavery. 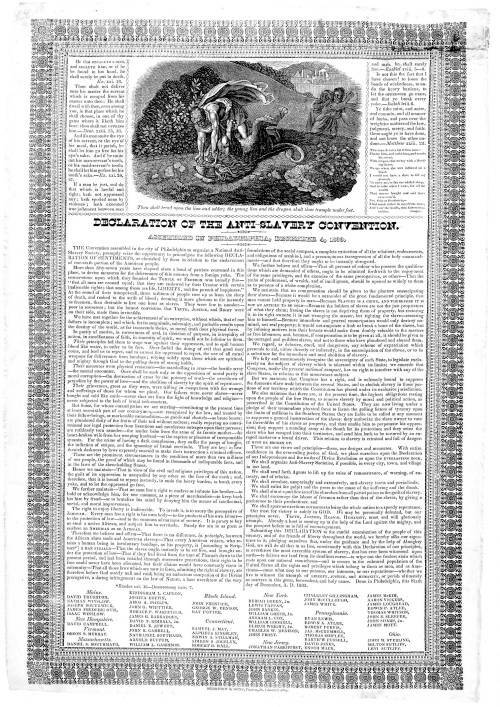 The main text is a manifesto, dated December 6, 1833, advocating the formation of a national anti-slavery society and enumerating its goals. It includes the names of delegates to the convention from ten states.